Stocks rose on most of the major bourses yesterday despite Angela Merkel’s comments that the summit would produce little in the way borrowing relief for Spain and Italy, which are facing soaring interest rates. The markets instead focused on some surprisingly positive U.S. economic data that demand for long-lasting manufactured goods rose much more than expected in May, and that the housing market is staging a comeback as pending home sales hit a two-year high. We have believed for some time now that the US housing market is bottoming out after a 5 year bear market, and with the population continuing to grow and thus clearing the excess inventory from the last boom/bust cycle. This is a necessary precursor for house prices to stabilise. US homebuilder stocks rallied strongly yesterday with Lennar and Toll leading the way, up nearly 4% and 5% respectively. 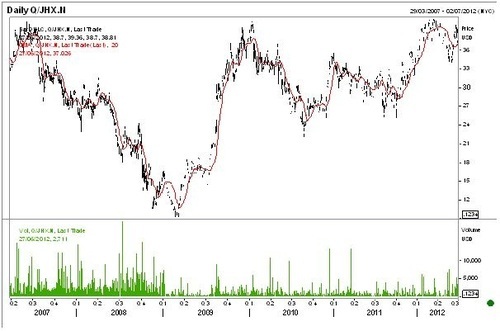 This is a chart of the US listing of Australian company, James Hardie (JHX). The chart structure is very bullish – and impressive considering the depressed state of the Australian and US housing markets. A new five year high seems imminent. But there is no doubting the very negative sentiment that is widely pervasive at the moment. Markets often reach infection points during times such as these and as discussed in yesterday’s note, the smallest spark of positive sentiment could trigger a very strong rally to the upside. The focus is clearly on the 2 day summit beginning tomorrow in Europe, and European Union leaders are now clearly divided ahead of the meeting on how to stem the bloc’s spreading debt crisis. ? The euro is continuing to lose ground against all the major currencies including the US dollar and this is providing a significant boost to the German economy with manufacturing companies and exporters doing near record levels of business. We believe the strong German economy is deceiving the German population into thinking that the Eurozone debt crisis has bypassed them. 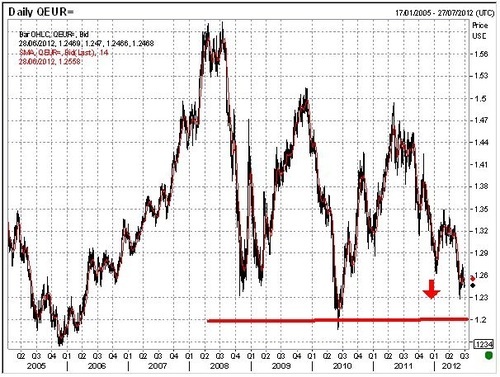 If the Euro falls below 1.20, other central banks could be prompted to also competitively devalue their exchange rates. Quantitative easing would be the most effective way of achieving this. Of course this is a false sense of security and in the event that the Italian and Spanish economies unravel further, recession will begin to bite the German economy as well. But by then it will be too late for Germany to try and turn the ship around. Angela Merkel’s continued intransigence is disturbing to say the least. With the euro under downward pressure and likely to test the key 1.20 level in the near term, We think the other central banks in the US, Japan, China and Australia will also be tempted to ease their exchange rates. The central banks (with the exception of Australia) will be increasingly of the view that further quantitative easing is justified now that inflation is all but subdued. 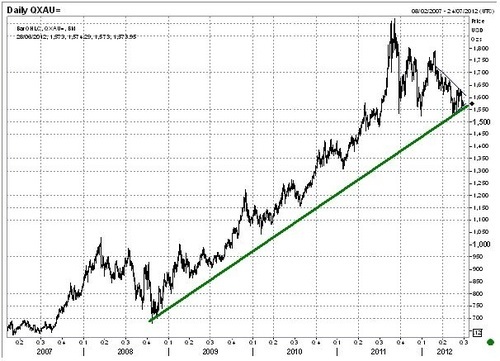 Gold is holding in above $1570, and whilst it is too early to say if the correction that began back in 2011 is over, we can expect a significant breakout of the converging triangle range in due course. 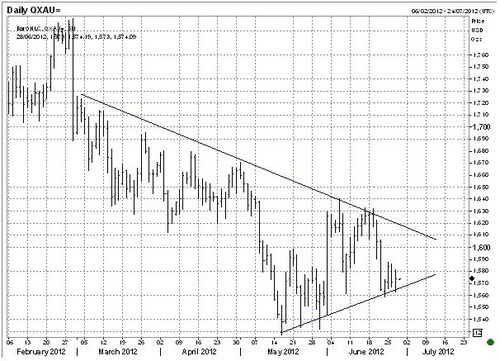 The summit or any central bank action over the next few weeks could well prove to be the catalyst. The overall longer term bull market remains intact and we continue to expect new highs within 12 to 18 months and possibly before the end of the year. In the event this week’s summit does no deliver at least a high-level agreement on greater fiscal and financial integration across the euro area, we can expect more volatility across the markets. The totally perplexing fact is that the Dow/S&P500 have held up so well whilst the VIX remains under 20. This is totally incongruent with the wider prevailing pessimism. Perhaps the bark is going to be worse than the bite?